Today goes down in the books as a Pretty Good Freakin' Day! From the start to the finish it has been good. For starters I got to sleep in this morning, I woke up without an alarm clock so I rested until my body was finished. I didn’t have any morning appointments so I had that luxury today. It was off to job #1, checking emails and returning phone calls. Then off to job #2. Well, with the winter weather looming over Tennessee people were a little scared to get out so it was not crazy busy at work. It was actually nice to have both jobs today be pretty relaxed. Then once the snow actually started I got the go ahead to close the gym. It was only a few minutes early but anytime you get off work early it’s a good thing. My sister called me while I was at work and told me that she cleaned out her closet and had lots of clothes that didn’t fit her anymore. That was a yeah for me and for her as well. She has lost quite a bit of weight and needs smaller clothes and I have 1 pair of jeans and 2 pairs of black pants so I could use some bottoms as well. I went up to work out and tried something a little different. I rode the bike while doing triceps, bicep and shoulder work. Instead of using a heavy weight I took a moderate weight and worked the different muscle groups while riding. It was an exhausting to the smaller muscle groups and helped me get my heart rate up. 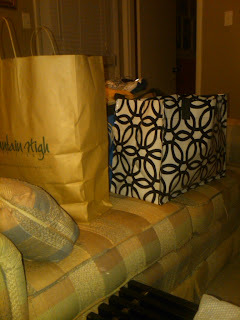 After I left the gym I got to brave the winter weather roads and go get the clothes that my sister had waiting for me. Not only did I get 2 bags of clothes, but I also got a super cute bag that I have been begging her for for 2 weeks. Side note: She showed up with this bag the day after I had knee surgery and I gave her the sad littlest sister eyes and asked so kindly if I could have it. The sad eyes didn’t get me anywhere so I threw in the surgery card. "Please can I have it....I had surgery yesterday?" (still sad eyes) Haha, victory, the bag is now mine!!!!! When I get out of the shower I am going to try on all of these new clothes and hopefully every single thing fits so I can wear more than one pair of blue jeans every day! Then the little things that top it all off: I have walked around in the slick snow and ice and not fallen down. You know there are those people out there that eat popcorn and get a kernel stuck in their tooth, I am that girl that always falls or slips in the snow. And I have not fallen yet! I say yet because until this crap melts I am still at risk! 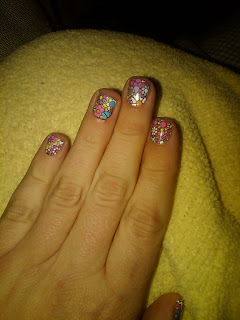 And my new manicure that I gave myself last night has held on all day long. I just knew the nails would chip or peel off and they are still hanging on strong. How cute are these? I hope you all had a great day too. I know I was a little braggy braggy but I love a good day! so glad you put up a picture of the nails! i love 'em! got to copy you and try them!